The overall objective of this project is to determine how different practices implemented by farmers when raising hogs impact the working environment and exposure to workers. The focus of this project is to characterize risks to pork production workers associated with two main occupational health issues: injuries and airborne exposures in the working environment. Affects concentration of airborne contaminants, including of respirable dust, biogases, and endotoxin. Modifies the frequency of exposure to known injury hazards and affects injury rate. The methods for raising pigs continue to evolve with a greater proportion being raised in high-density confinement facilities. Working in these facilities is not without hazards and exposure to airborne contaminants, including hydrogen sulfide, ammonia, endotoxin, and particulate matter, is common. At sufficient concentrations these contaminants can affect the respiratory system. As pork production practices change to meet the animal health, economic, and societal concerns it is likely the potential exposures to workers will also change. One of the aims of this project is to compare air contaminants in facilities that use different rearing methods and characterize the seasonal influence on exposures. We studied a facility over the course of a year that has parallel systems that keep gestation crates or gestation pens and finishing barns with feed delivery systems for both wet and dry feed. We were able to characterize the potential air contaminant exposure risks to ammonia, hydrogen sulfide, carbon dioxide, heat, endotoxin and respirable dust. 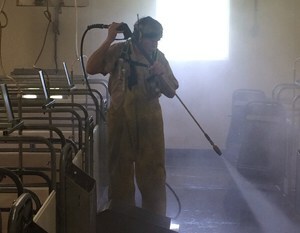 Subsequent to the year-long study, we have focused on characterizing exposures to ammonia, hydrogen sulfide, endotoxin and respirable dust during power washing of farrowing and gestation rooms. The greatest influences on worker exposure are season and location within the facility. The ventilation requirements needed to keep sows and finishing pigs cool in the summer also act to reduce air contaminant exposures to very low levels. In the cooler months concentrations of all contaminants rise and may be ten-fold higher than in the summer months. 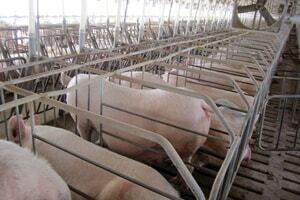 In this facility, concentrations of measured air contaminants are greater in the gestation room with pens than in the room with gestation crates, with varying levels of statistical significance. In addition, contaminant levels in areas of the facility where pigs are not present are considerably lower than those where they are. While contaminant concentrations are below regulatory limits throughout the facility, the potential health effects of being exposed simultaneously to three respiratory irritants, ammonia, hydrogen sulfide, and endotoxin, are not well known. In the process of conducting the systematic measurements throughout the facility, a substantial spike in hydrogen sulfide and endotoxin levels was noted during power washing in the room with gestation crates. The spike may have been the result of the power-washing displacing hydrogen sulfide from the manure collection pit. 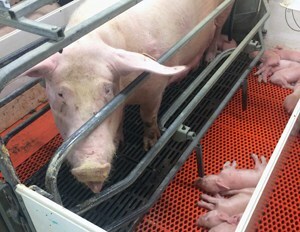 Subsequent tests during regular power washing of farrowing stalls between litters indicate that hydrogen sulfide and endotoxin concentrations are always elevated while ammonia and respirable dust are not. The endotoxin levels are of particular concern relative to proposed guidelines. In the finishing barns where feed was delivered in a wet slurry, the level of endotoxin was substantially lower, although the concentration of respirable dust was similar. Heat is another factor with a potential impact on the workers. On hot and humid summer days the temperature in the facility can be stressful to the workers and animals alike. Being aware of the risk of heat related illness, i.e. heat exhaustion and heat stroke, and methods to control that risk is important. The results of this study to date are now being communicated to producers to create more dialogue about understanding and controlling exposures in these facilities. 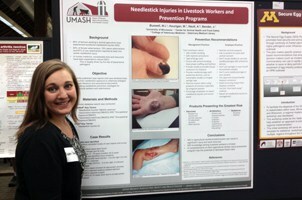 This project is also exploring injury risk associated with pork production. A challenge for reducing the burden of injury in the industry is the lack of comprehensive data for guiding prevention efforts. Data with sufficient detail to identify prevention measures are not routinely or uniformly collected. To better characterize injury burden in the industry and to make recommendations for injury data collection we have partnered with the National Pork Board to engage companies that collect injury data in various forms. These varying data resources are being used to describe injury and illness occurrence in the industry in more detail and to also explore mechanisms to improve injury surveillance in the future. The results of this project will provide information to aid producers and health and safety professionals in reducing potential health risks of raising pork. 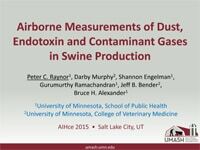 Presentation by Peter C. Raynor, PhD, at the American Industrial Hygiene Conference & Exposition (AIHce) in Salt Lake City, Utah on June 4, 2015. Murphy D, Engelman S, Raynor PC, Ramachandran G, Alexander BH. Characterization of Air Contaminants Associated with Type of Swine Production Facilities. Journal of Agromedicine. Minneapolis, Minnesota. June 09, 2014. Murphy D, Engelman S, Raynor PC, Ramachandran G, Alexander BH. Characterization of air contaminants associated with type of swine production facilities. North American Agricultural Safety Summit. Minneapolis, MN. September 25, 2013. Murphy D, Engelman S, Raynor PC, Ramachandran G, Alexander BH. Characterization of air contaminants associated with type of swine production facilities. Points of Pride, College of Veterinary Medicine. Saint Paul, MN. October 2, 2013. Raynor PC, Alexander BH, Bender JB. Murphy D. Air Contaminant Concentrations Associated with Pork Production Practices: A One Health Question. Swine Medicine Seminar, U of Mn College of Veterinary Medicine. Saint Paul, MN. April 4, 2014. Murphy D, Engelman S, Raynor PC, Ramachandran G, Alexander Bh. Characterization of air contaminants associated with type of swine production facilities:. National Occupational Research Agenda. May 1, 2014. Murphy D, Raynor PC, Engelman S, Ramachandran G, bender JB, Alexander BH. Effects of Production Practices and Environmental Factors on Air Contaminants in Swine Facilities. Allen D. Leman Swine Conference. St. Paul, MN. September 13-16, 2014. Raynor PC and Alexander BH. Effects Of Production Practices and Environmental Factors on Air Contaminants in Swine Facilities. Southern Research and Outreach Center Swine Operations. Waseca, MN. September 29, 2014. Raynor PC, Murphy D, Engelman S, Ramachandran G, bender JB, Alexander BH. Effects Of Production Practices and Environmental Factors on Air Contaminants in Swine Facilities. 7th International. 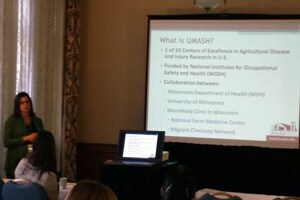 Symposium on Safety & Health in Agricultural & Rural Populations: Global Perspectives. Saskatoon, Saskatchewan. October 20, 2014. Green DR, Evanson J, Bender J, Alexander BH. Injuries among swine workers related to swine human interactions. 2016 Nora Symposium, May 4, 2016, Minneapolis MN. Additional funding for this project was provided by the National Pork Board.